Owning a solar powered atomic watch is an awesome hassle free experience, the watch practically runs itself with literally zero maintenance. No need to worry about the battery life because its solar, and no need to worry about the accuracy of the time because it’s atomic. Which means all your left with is a super functional and beautifully engineered piece of art! The only other way to keep your time updated perfectly is with a Bluetooth capable timepiece that can connect to your mobile device, thus allowing you to sync with the satellites. So far not many of these wireless watches are available yet, besides smart watches, which are actually going through quite a booming phase right now and you can expect to see more of these in the next few years. If your not too keen on rocking a smart watch just yet, but you want to keep laser precise time on a sporty active lifestyle kind of watch, then solar atomic is definitely the way to go. So far I have found 4 models that deserve a shout out, I think you will love them! I hope to update this list as I discover more of these astronomical timepieces. Oh, and be warned, they are all made by Casio! 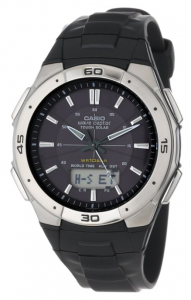 This is one of the more popular solar atomic timepieces that Casio makes. They maintained the cool look of their G-shock range while implementing their advanced eco friendly engineering, making this one of the most versatile models available. The GW2310FB-1 is multi band enabled, is also shock resistant, time zone friendly, and water resistant to 660 feet, which is suitable for entry level scuba diving. This watch is truly maintenance free, it can run for 10 months on a single full solar charge, this could prove to be an amazing benefit if you have a busy hectic lifestyle. Scrolling through some of the feedback on Amazon was also particularly informative, with some buyers claiming that this watch is one of the most durable they have ever used, having used and abused it through multiple wars in Iraq. This watch is awesome, it has a nice low profile style to it, and is built like a tank. The band is made of a rubbery resin material, the watch is encased in a strong resin plastic and reinforced by the stainless steel face and bezel. There’s a couple Waveceptor models, some of them are slightly cheaper and aren’t equipped with the solar power charging, this model that were talking about here is the best one in my opinion, and also preferred by many others who have bought this watch. This active life timepiece has a really well functioning receiver, allowing for atomic time matching every night, to ensure that you have the most precise time possible. Some atomic watches are known to be finicky in terms of automatic time setting, but this one is known to set very easily, even if the watch is tucked away in a drawer, or in the basement of a house. A very reliable watch indeed. But some caveats include a somewhat scratch prone crystal window, and a lighter then normal alarm function. Here’s a model from Casio with an over all lighter complexion, which is kind of refreshing if your bored of the same old black and stainless combinations. It’s easy to match this watch with work clothing, even a suit, as it is somewhat more professional looking then some of the other more rugged G-Shock models. Even though the look is very different to some of the other models, the functions are still overall very similar. One of the more enticing aspects to this watch is it’s comfortable design, with no noticeable arm hair pulling or rashes. The MTGM900DA-8 is very easy to use as well, and will suit someone who likes large displays, making the time and date very easy to read. Best of all it’s equipped with solar and atomic technology, keeps up to 48 timezones, and is water proof up to 200 meters. Casio has been around for ages now, and they know how to make a solid digital timepiece that keeps on going. 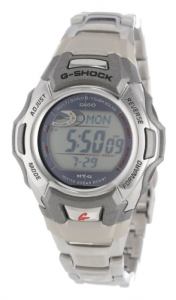 This model again has a fairly similar look to the other solar atomic watches from Casio. 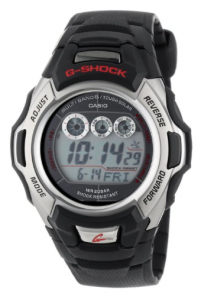 This one is on the smaller side of the spectrum, it’s not big and bulky like some of the flashier G-Shock models, but it’s not thin either. In my opinion an excellent size for light sports like jogging, swimming, and anything else that isn’t too strenuous. The material used to build the watch is actually very high quality, with a nice durable resin frame and band, the bezel of the watch is encased in a polished stainless steel. This is also a great watch if your expecting to use it in rough conditions and don’t want to worry about beating it up. The GWM500A-1 is in its natural habitat when going through rain, snow, mud, and any other extreme conditions, for it’s bargain price of around $70 it should be on your must have list! I am surprised there are no Citizens on the list. These all seem good for sport watches but what about some eco-drive atomic dress watches? Maybe the Skyhawk or Nighthawk. Hey Devin, those are also great models! I will be updating this list with more models soon. If you know of any others feel free to drop them in a comment and I will have a look! I second the Eco-Drive, I have a Citizen AT4010-50E and it has all the premium materials that you get in a luxury watch like Sapphire Crystal and Titanium housing. it has Eco-Drive for solar charge and, of course why we’re on this page, atomic time. Last but not least, it has great complications like day/date with perpetual calendar. Even if you couldn’t get the solar to sync, the perpetual calendar even accounts for leap year, which to me is an insane feature. I was a bit hasty in my post. *Even if you couldn’t get the atomic time to sync, the perpetual calendar even accounts for leap year. The pioneer of solar atomic timepieces, Junghans, seems to have been omitted altogether. Have a look at http://www.junghans.de. I have one and I’m very pleased. Which atomic watches are easiest to adjust to various US and international time zones? I have a Casio watch however it seems to me (technically challenged person) too cumbersome when I fly to London and then on to Hamburg to reset the watch at those various places. I thought that all would happen automatically. The instructions which came with the watch are hard for me to decipher and to understand and to execute correctly. Frustrated with my watch in Seattle. Is it correct. If I buy an atomic watch in Asia outside china will it work? The New Citizen Eco Drive AT covers all 5 regoins that have a time signal. I have a Casio Pathfinder Tough Solar that cover 5 Band which I believe is the same thing. Of course you have to let your watch know what frequency to look for. Watches with GPS currently don’t have a good battery life. If you’re needing a watch with a compass, altimeter, barometer, etc the Casio Pathfinder are great however the data isn’t that accurate and are only good for reference. I wouldn’t want to navigate with only a Casio pathfinder… so I wear a citizen Eco drive AT Navi hawk and carry good field gear. But solar and atomic wise the citizen and Casio are both good and reliable.